When I was little, my favorite meal was my Grandma’s spaghetti and meatballs. This is her recipe, but I can never make it taste just like hers. I think she had a special spoon she stirred it with. Cooking the sauce on the stove and simmering it for hours makes it taste better than cooking it in the crockpot, but I didn’t have hours the other day. It was still yummy in the crockpot. It only took a few minutes to put the sauce together and turn the pot on high. I had already made the meatballs, so they just had to be added to the pot to heat with the sauce. Saute the onion and garlic in a bit of olive oil. Combine all the ingredients in the crockpot or large cooking pot on the stove. I didn’t measure any of the spices, but used about 2 tsp of each, less for the garlic powder. I use 2 bay leaves. Salt and pepper are to taste. I used about 2 tsp of sugar and about 1/4 cup of parmesan cheese. That is all just a guess though, because I really just eye-balled it and then went by taste. Let it cook several hours or as long as you have time for. I didn’t get a picture of the spaghetti with sauce on a plate. We were all ready to dive in and I forgot about taking a picture. It is really hard to remember to take pics with every step when you intend to blog about it. I did it once with my pepper pasta dish and thought it was very time consuming. I have a new respect for your blogging abilities. I love slow simmering sauce for spaghettz! Don’t all grandmas have that special spoon?? I think mine did!! Nothing’s better than making your own sauce. Looks yummy and simple. I’ve *almost* got my potato salad to be just like grandmas. I just can’t remember how she always cut her potatoes so perfect – not too big, not too small. I’m going to try this since I always have tomato sauce in the pantry. Ooh! 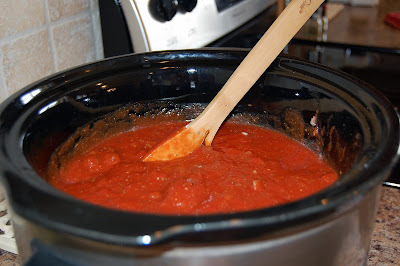 A crockpot spagetti sauce! What a good idea! Mmm…I would have been ready to dive in too! Looks like an awesome sauce. I love that it is done in the crockpot!! 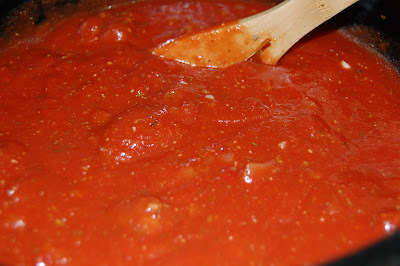 I have to admit it… I’ve never tried to make homemade spaghetti sauce! But I think I’ll have to finally try it with this recipe! Your sauce looks wonderful! There’s something about homemade spaghetti sauce that makes you feel everything is great! I like that you used the crockpot too! Sounds delicious, and you just can’t beat a good grandma recipe. It’s delicious! Let me say Congratulations! I’m italian, so I love spaghetti sauce! You mentioned meatballs, do you have a recipe for those? Courtney, I’m afraid I’m not a very good meatball maker. I do make them, but they just aren’t great. If I finally figure out the secret to wonderful meatballs, I’ll let you know. If you use petite diced tomatoes, and ditch the tomato sauce, you keep the cost about the same, the amount of food about the same, but it will be slightly more textured. 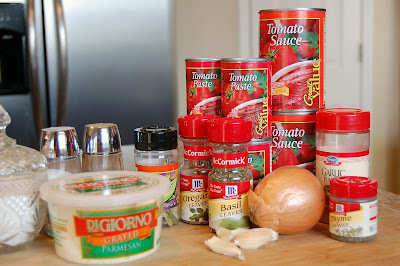 Sauce like Grandma’s… one thing that makes a huge difference in tomato sauce for me is the brand of canned tomato you use. I buy off brand all the time when I don’t have a coupon… except for tomato and sauce. Have you tried using a different brand of tomatoes to see if you can get the taste you are looking for? I have yet to find the perfect sauce for me… I’m adding this to the stack of sauce recipes I need to try out. Dani, That’s a good idea. I’ll have to ask my mom to see if she remembers what brand Grandma used. Britney, I think this would easily fit in a 4 qt crockpot. Mine is a 6 qt., but this recipe doesn’t come close to filling it up. This was GREAT! I used it with a pasta bar dinner party I had one nite- had leftover sauce and used it in homemade lasagna! GREAT recipe- using it again! Sounds great and a time saver recipe. I’ve tried a lot of your recipes and love the shopping list for the week. One question for those of us who are not so confident without exact measurements, I get frustrated when the recipe reads add a little bit of that and a little of this, ah!! my older sister is a great cook and she tells me recipes all the time, but I’ve given up on her because she goes by sight. I can’t do that just yet. So please, please, when you give recipes include the amounts and sizes of cans because if we don’t print your pictures and you mention one can of tomato sauce, unless we look of the picture we can’t tell. And by the way, did you add the parmesan cheese, which is grated according to your picture in the crockpot or used it to put on top of the sauce to serve? Thanks for all your wonderful recipe. Dee, I did use the Parmesan cheese in the sauce. I’ll try to start giving more exact measurements. Don’t be afraid to experiment on your own though. Add some seasonings,, taste and adjust. With practice you’ll be a pro! Thank you for responding so quickly. I used a crockpot on high and added frozen meatballs. The house smells so wonderful. We have a home office and clients have asked us to come over for dinner many times. I’ve shared your site with friends, family, and clients. I think the efforts that you’ve put into creating the site and sharing recipes with others is fantastic, you’re an ANGEL. Thanks to you I’ve become more organized. I don’t know when you get the time to do all that you do, but keep up the good work you’re a super woman and my hero! P.S. Don’t forget to include measurements, ha! ha! Again, thanks. You have alot of great recipes and I love your website. But how do I print out your recipes. I don’t see a “print” button on the page that shows just the single recipe? Michelle, here’s an explanation of how to print. I love this recipe and have used it a few times. I was wondering thought, do you use 4 small cans of water or 4 large cans of water? I usually just eyeball it, but was curious. Thanks! Tamara, I use 4 small cans. I fill the 6oz tomato paste cans with water. Quick question, 4 cans of water- are those the small tomato paste size cans or the large tomato sauce cans? Thanks! Oops, never mind, just saw the answer. Thanks!! I want to make this sometime this week. You said cook it for a few hours. Like 3, 4, 5? Cook it on low I persume as well? Looks delicious! Cook it at least 3 hours (for a short time like 3 hours, you may need to cook it on high) , but up to 7 or 8 on low. Dumb question…do you keep the lid on the crock pot while it’s cooking because on the stove I don’t cover my sauce while it’s cooking? Sheera, I do keep the lid on while it’s cooking in the crockpot. I use the empty 6oz tomato paste cans. Hi! This recipie looks great- I plan on doing it on the stove- (1st time sauce maker) :). How long would you suggest cook on the stove…on low heat? It really only has to cook until it’s hot through, but the longer you cook it the better. So an hour minimum on the stove-top, but you can add several hours if you want. Which can the paste or sauce should be used for water? I am cooking this sauce now and it seems bitter due to using 4 can of tomato paste . I have added more super and wonder if u have any suggestions. You might try adding a bit of sugar. I’ve never had it turn out bitter before. Maybe it’s the brand of tomato paste you used? I’m not sure if this blog is still active, but I just wanted to let you know that I found this is 2009, and have used this recipe ever since. It’s our favorite sauce for Pasta Sundays! Tamara, the blog is still active 🙂 I’m glad you like the spaghetti sauce recipe!